Route 20 Coast to Coast: Springfield to US 7 cont. 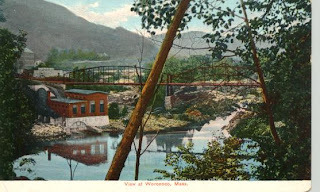 Woronoco, 15.5 m., is best known as the home of the Strathmore Paper Company Plant (open by permission), across the river. The village is at the junction with State 17. The Murrayfield Grammer School on the Worthing Rd. houses a historic bell stolen by Union soldiers from New Orleans during the Civil War. Boulder Park (camping, swimming, picnicking), 24.1 m. (L), deriving its name from a huge rock by the roadside, is in the Chester-Blandford State Forest. At 28.8 m. is the Cortland Grinding Wheels Plant, one of the largest manufacturers of emery wheels in the country. Beyond the factory is a Fountain, a water spout at the end of the town water main, which in winter freezes to a glittering mosque-like dome 50 to 60 feet high.